Blackjack lovers know that there are several variations of blackjack played in land-based Las Vegas and Atlantic City casinos. Here we`ll talk about significant differences which allow to recognize a certain variation from the first sight. Moreover, in Las Vegas itself blackjack is played by different rules. One variation is played in casinos located in Las Vegas Strip, while the other - in Downtown Vegas. So, we can differentiate between three variations of American blackjack. What is common about American blackjack variations? To start with, in American blackjack the dealer deals two cards for himself/herself and opens one of them (the so-called Hole Card rule). In European blackjack, the dealer receives only one card face down and takes additional cards after the players have placed their bets within all betting boxes. 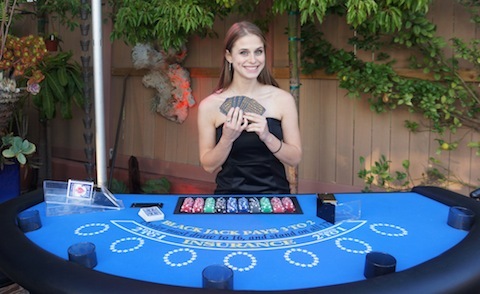 Card value, the aim of the game, and basic rules are common for both American and European blackjack. The aim is to create card totals which will turn out to be higher than the dealer's hand, but without exceeding 21. The player and the Dealer can count their own Ace as 1-point or 11 points. Face cards are counted as ten points. All other cards are counted as the numeric value shown on the card. All payouts are identical in both variations. Let`s look at three variations of American blackjack more closely. Some casinos allow double after split, while others allow double only after Ace split or forbid it at all. Moreover, you can see further deviations from regular blackjack rules – Ace split only, compulsory double after Ace split, etc. Blackjack played in Las Vegas downtown is almost identical to Las Vegas Strip Blackjack. The major difference is that the Dealer always hits on soft 17, which increases house edge by 0.2%. The game is played with 2 regular decks. In some casinos, especially online ones, Vegas Downtown Blackjack rules may differ. In some Atlantic City casinos the Dealer doesn’t check for Blackjack. If the Dealer has a Blackjack, players lose their original bets only, but get their money for splits and doubles back. There may be deviations concerning re-split, double after split, surrender, and other aspects of the game.